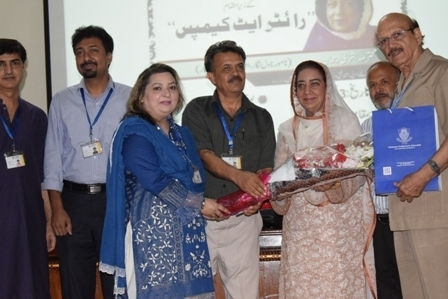 Renowned novelist, columnist and politician Bushra Rehman delivered a lecture at FCCU under the Bazm-e-Fikr-o-Nazar Society’s monthly series of lectures titled “Writer @Campus”. Every month a renowned writer/columnist will deliver a lecture under this initiative, and this was the first of the series. 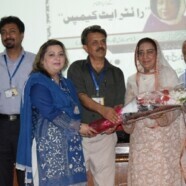 Bushra Rehman has written a number of literary books and novels and has been in politics for 20 years. The session will help the Mass Communication and Urdu Literature students improve their writing skills. 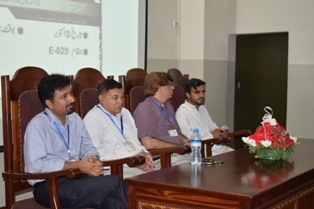 Faculty from both College and University sections attended the lecture, which was supervised by Head of Department Dr Akhtar Shumar and Advisor Dr Tahir Shaheer. 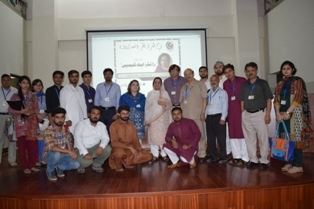 The President of Bazm-e-Fikr-o-Nazar Society, Muhammad Aqib Irshad, along with his team, Shahbaz Khan, Azizullah Rizvi, Hasnain Awan, Hassan Abbas, Jawad Mehdi, Asfand, Rabbiya Tareen, Zainab Azhar and Esha Shahid worked hard to make the event a success.